This is part of my Photography HOWTO series and follows on from Understanding Exposure. I will be looking at colour, common problems and what to do about them. It seems taken for granted that colour is made from red, green and blue (RGB). Minor problem: it's not true. Colour is in fact a whole range of coloured light (part of the Electromagnetic Spectrum). It just so happens that humans only see the world in wide RGB bands (well, most of us: about 1% of women actually have 4-colour vision) in of this full spectrum. The result is that with RGB we can trick the human eye into thinking it is seeing a colour, but it's not actually that colour. This subject can get very complicated very quickly, so for now, the main point is: RGB is not the whole story, but only a means of tricking the human eye into seeing different colours. Reality is, that it simply isn't possible to get a perfect match for all colours while dealing in RGB because it is a very limited view of the real world of spectral light. What further complicates things is that because of the limitations of RGB, we can have different light sources that look the same colour, but objects in that light appear differently with each different light source. Weird huh? Now, at night go and stand with the same cards under a Low Pressure Sodium Lamp street lamp, making sure that there are no other light sources (eg. car headlights, light from nearby buildings, other types of street lamps etc.) around that will contaminate the experiment. What do you see? Interesting..... With the RGB light from the monitor the R and G show up, but the B is dark - no surprise there, but with the deep orange street lamp, only the orange card still shows up, but the R, G and particularly B are dark, and more significantly the colours are completely different despite the white background coming out almost exactly the same. What is happening here? This is simply because orange on the screen is the illusion of R and G making orange, but with the street lamp it is pure orange light, so only colours sufficiently close to orange (Orange and to a lesser extend R and G in this case) show up. The interesting thing here is that the R, G and B cards don't actually appear in their original colour as there is no R, G or B light to reflect off them - only orange which they reflect to varying degrees. This is important - If all the colours are not present in the light hitting the scene, then you can't get all the colours back out by compensating for it. Extreme examples aside, what most people want is a photo that looks the way that human perception would see the world. Bad news: not always possible. You can experiment with setting the white balance on your camera to daylight and then take a photo indoors (without flash) in tungsten lighting. Likewise, if you set your camera to tungsten and take a photo in daylight, it will come out very blue. Modern cameras have auto white balance which tries to work out what the type of light is and automaticaly choose the right balance. It is not always perfect, and if you want consistent colour then it is often best to turn it off and set the balance manually to avoid it making different decisions on different photos. Another thing that some cameras have is the ability to photograph a neutral object (say some photographic grey card) and tell the camera to create a custom white balance from that. With film, there are two options: use a film that is balanced for that light, or use a correction filter. 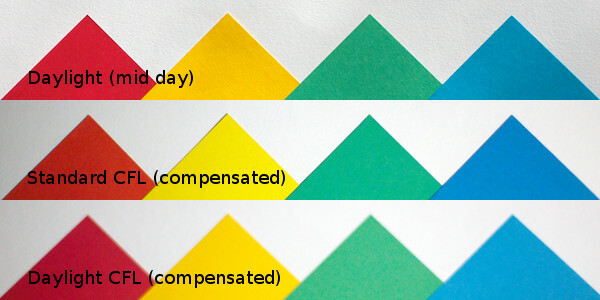 The filters simply reduce the colours that are excessive down to the same level as the lowest colour. 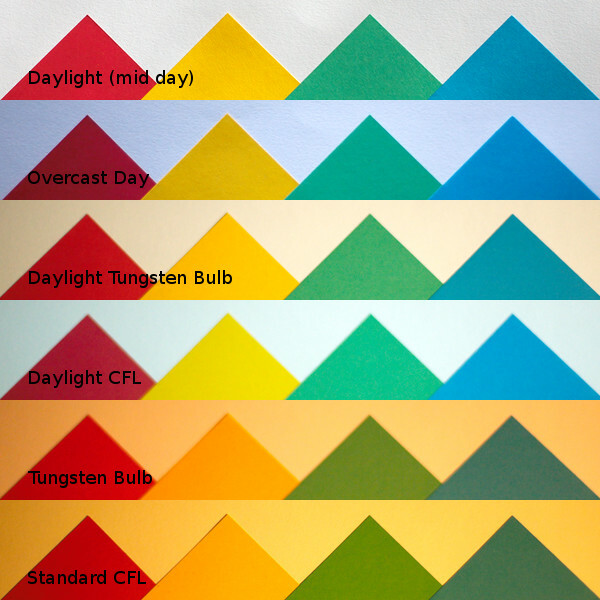 The typical filter that may be used is an 80A (or B, or C depending on how strong you want the effect to be) for turning tungsten light into daylight. The catch with filters is that they reduce the light, so you have to use slower shutter speeds, larger apertures and/or faster film. With digital, it is generally better to avoid filters as we can maximise the amount of light we are working with as under these artificial lighting conditions we often only have limited light. If you are getting inconsistent colour, or are having problems with blue or orange tints to the images then this is where you need to look. Your camera manual will probably have more information on setting white balance. Low pressure sodium (see above) is one of the most difficult light sources around - it virtually only contains orange light, and so it is not practical to fix it with white balance - there is simply no other colours to balance with. The easiest thing is simply to treat it as black and white and loose the colour all together. Getting a bit easier, many other light sources have uneven spectrums: all the different types (phosphor blends) of flourescent lighting, high pressure sodium, mercury lights and many other types. These vary in colour balance (eg. 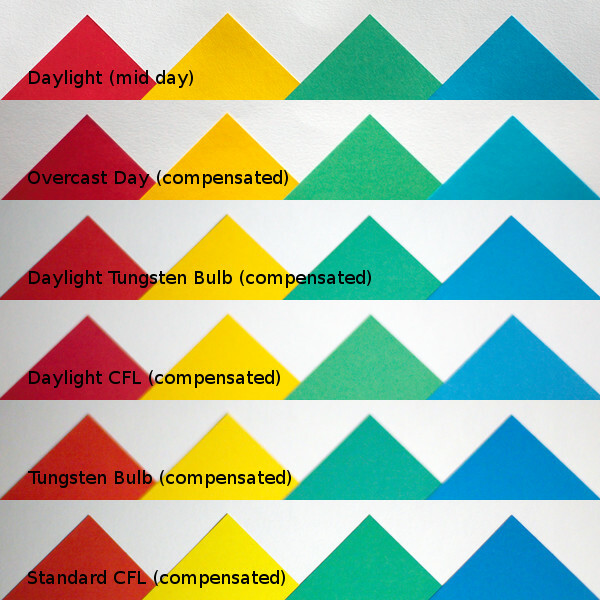 flourescent lamps are often tungsten balanced - domestic energy saving blubs, yellow green - warm white tubes, yellow to slightly purple - cool white tubes, and white - full spectrum tubes), but also have an undeven / spiky spectrum. When there are different types of light sources (eg. sunlight through a window mixed with flourescent indoor lighting), then things get more tricky. This would also apply to photos in direct sunlight with a clear blue sky where the shadow areas will only be getting light back from the blue sky (blue light), whereas the direct sunlight is white (ever notice the deep blue the shadows in high altitude snow photos?). Without all sorts of complications, it is often not worth the trouble of balancing this kind of lighting. In major big budget commercial shoots there may be sufficient budget to have an army of assistants put colour balancing gels over every light source to bring them into line, or sometimes some crafty digital editing can make things good enough, but this is generally out of question for most people. There is one exception which is rather easy: mixing flash with tungsten. Flash normaly gives a near daylight balance (sometimes a little on the blue side), where as tungsten is distinctly orange. When flash is mixed with tungsten then we end up with a mix of blue or orange tinted areas in the photo. This is very easy to solve: put an orange gel (check with the manufacturers specifications on which of their gels is suitable) over the flash and then the flash light will match the tungsten balance. Human eyes have to deal with all the these things, but we adapt to the light without even realising it consciously (rather like a particularly good auto white balance on a camera). This is called chromatic adaption. The reality is that we still can't percieve colour accurately under bad lighting, but we don't even realise that most of the time. It's a bit like thinking back to something I saw on TV as a kid and remembering the colour of something, only to realise that we only had a B&W TV at that time - we subconsciously make up the missing bits from memory. Up until now we have been looking at getting a white balance, but when it comes to art, reality may not be what we are looking for. The colour tint of an image can have a big influence on the mood of the photo. If we leave some of the orange light from tungsten in the image (partially correct) then we can end up with a warm cozy feel to the image. Likewise a photo on an icy winter morning with a slight blue tint will give a photo a cold/icy feel. There are various other colour tints that can be given to vary or emphesise the particular feel of the image, or even mixed within the same image (eg. warm interior lighting with cold outdoors through a window). One trick I use with tungsten gels on flash (see above) is to slightly under correct. Then balance the image for the slightly under corrected flash and the result is that the background (lit by tungsten) is slightly warm and more cozy even though the foreground (flash lit) is balanced. These sorts of deliberate colour imbalances are widely used in independant cinema. Serious photographers use RAW format instead of JPEG. Not all cameras can do this, and there are some hacks for some cameras like CHDK which add RAW and other functionality to some Canon digital cameras. One of the many advantages (more about them as we go on) of RAW is that it stores the data directly off the sensor, before colour balance and other processing is done. This means that choosing the colour balance does not have to happend when we take the photo - we choose the way we want it processing when we process the RAW files into images afterwards. This allows us to experiment and taylor the final appearance of the image to what we want, and even have several versions with different balances. It also makes other tricks viable like blending together different colour balance versions of the image to correct for mixed lighting or create specific effects. Although some colour adjustment is possible when shooting in JPEG, the options and extent to which it can be adjusted without artefacts and serious degredation to the image is very limited in comparison to RAW. The main thing from this article is simply to create an awareness of colour and to realise that different light sources will change the appearance of colour, sometimes in completely uncorrectable ways, and that altered colour can be a positive thing where it compliments the artistic aspects of a photo.